Rody Fight – Game for Change is a game for all action fans but the app comes with some unusual features that make it a little strange. The app puts you in the shoes of Rody, who happens to be the Android equivalent of Batman, Superman, Spiderman, you name it. Rody wants to clear his country from crime, corruption and drugs and that’s why he sets on a quest to punish the bad guys. The gameplay that comes with Rody Fight – Game for Change is something that perhaps you have not seen before – Rody stands in the left half of your screen while the bad guys come from the right side. When you play for a while you will realize that there are three rows of bad guys coming at Rody so you have to punch and kick them in the right sequence with guys closer having the priority. Otherwise if you kick just the guys in the middle, the enemies in the top and bottom rows will cut you with their knives and bleed you to death. Fortunately the game gives you some time to think but don’t be too slow. The game comes with numerous levels so if you are successful, you will be playing it for quite some time. Rody Fight – Game for Change has another unique feature – the game looks and feels like an arcade game from the 1980s so prepare for some pixilated graphics, simple sound effects and more of the like. This is not a downside, at least to us, because the outdated visuals give the game a distinctive atmosphere. Now if you were born 10 years ago, chances are you will not appreciate the visuals but older Google Play fans will. All in all Rody Fight – Game for Change is a nice casual game that will appeal to fans of the action genre if they are not too picky when it comes to graphics and sound. The app looks like a game from the 1980s but this can be nice, given how you look at it. In any case the outdated graphics bring a unique feeling and this is not to be underestimated. 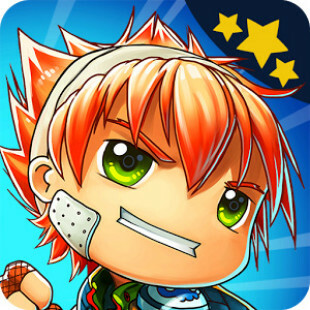 Rody Fight – Game for Change is here on Google Play.